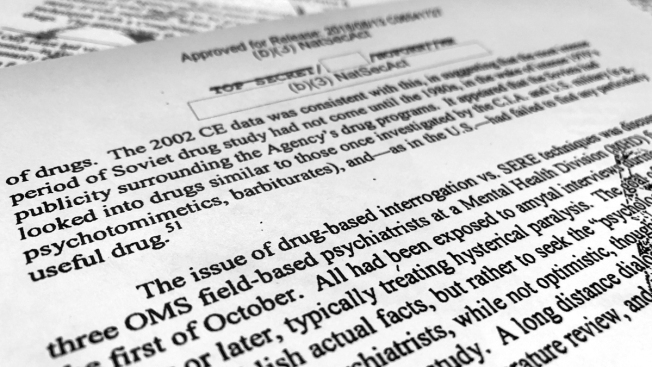 The CIA ultimately decided against asking the Justice Department to approve drug-assisted interrogations, sparing CIA doctors "some significant ethical concerns"
A portion of a once-classified CIA report that disclosed the existence of a drug research program dubbed "Project Medication" is photographed in Washington, Tuesday, Nov. 13, 2018. Shortly after 9/11, the CIA considered using a drug that might work like a truth serum and force terror suspects to give up information about potential attacks. After months of research, the agency decided that a drug called Versed, a sedative often prescribed to reduce anxiety, was “possibly worth a try.” But in the end, the CIA decided not to ask government lawyers to approve its use. The American Civil Liberties Union fought in court to have the report released. Shortly after 9/11, the CIA considered using a drug it thought might work like a truth serum and force terror suspects to give up information about potential attacks.